Varanus prasinus is a small to medium-sized arboreal monitor lizard. It is known for its unusual coloration, which consists of shades from green to turquoise, topped with dark, transverse dorsal banding. This coloration helps camouflage it in its arboreal habitat. It uses its prehensile tail and long claws to grip branches. Unlike other varanids, this monitor defends its tail rather than lashing with it for defense when threatened. 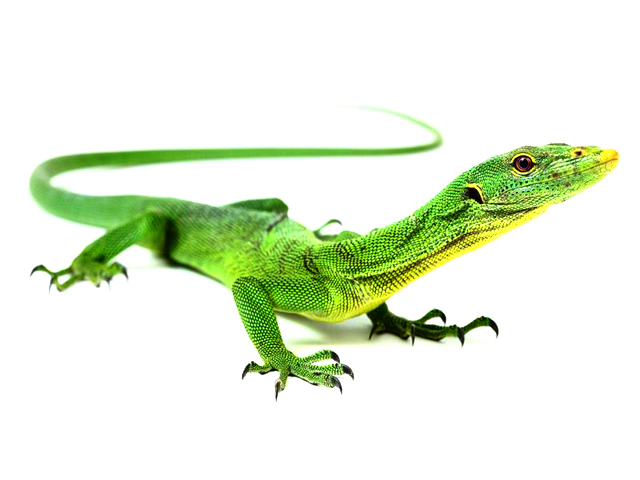 The soles of the feet of the emerald tree monitor have enlarged scales which aid the lizard when climbing. I use a 5.0 UVB light and for heat, create a basking temperature of 44-48 °C (110-120 °F). The ambient temperature should be 27-32°C (80-90 °F). Lighting is on a twelve hour cycle. Night time temps should never go below 24 °C (75 °F). If the humidity is correct (70% and above) you will not have any shed problems. There is no need to soak these monitors, they are not aquatic and do not like it. Soaking them will stress them out and cause them to be afraid of you. The only time you may need to soak them is if they have stuck shed on their toes or tail tips due to not being kept at proper humidity levels. It is important to get off stuck shed because it can restrict blood flow and cause the toes and tail tip to fall off. 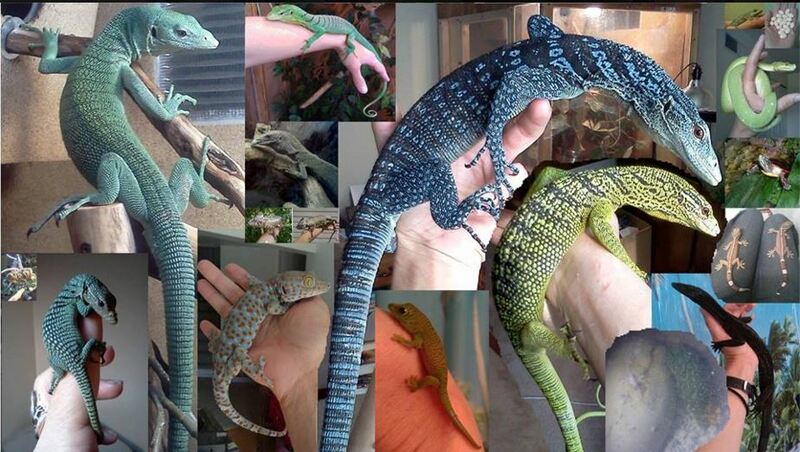 Many tree monitors also have respiratory infections from a combination of stress and being kept incorrectly by the supplier/pet store. These infections will need antibiotics your veterinarian can prescribe you. Sometimes tree monitors will have fungal infections. At first it may look like a gray area that’s going to shed or it may look like a bruise or burn. Eventually the area will spread or new areas will pop up. It does not heal normally and go away. You will need anti-fungal medicine for these areas. After treatment the area will heal and you will see a scar. After a few years, colored scales will grow over the scar and it will not be as noticeable. Fungus is very contagious and spreads through the air so quarantine in a separate room away from other reptiles as soon as you notice infection.